Good morning, all. Winter has settled unexpectedly around these parts — and by that I do of course mean the comparatively mild version of winter we have over there. Still, it gets me down, even if I know it could be a lot worse. The proper cold has finally arrived, the dark is here to stay, and I’m shaking off what remains of my first bad cold of the season. Also, after a few windy days last week, all the golden leaves I had so much fun photographing are gone: the trees are bare, the nights are long, and I feel myself slowly beginning to settle into a quiet, retrospective end of the year mode. I don’t feel guilty when I don’t blog better or more often: why would I? It wouldn’t make any sense, since I’m not answerable to anyone about it. I just feel disappointed, because I really like writing here, especially about books that have stimulated, moved, or provoked me, and when I’m not doing that kind of writing here, it’s often a sign that I’m not quite living the life I want. That’s it exactly. What I do here matters to me, so here’s to more writing in the weeks to come. The 32 Types of Anti-Feminists by Barry Deutsch. Eric Lundgren reviews Part of Our Lives : A People’s History of the American Public Library. I would love a British or European history of public libraries too — which isn’t to say I’m not also interested in reading this one. Speaking of libraries: what Stefanie said. It’s a hard world to live in, the world we’ve been given. The world to which most of us did not consent. I have been saying you’re not alone a lot and it’s not you and no really it’s not you and really for real, it’s not you. Living with pain is hard and living with the pain of people you love when you are not in pain is hard because you want to fix it and you can’t, you want to take it away and you can’t, you want to undo all the things that are wrong with the world and you can’t. You can sit with the raw flesh and the gristle, you can think about the times you yourself were a walking wound making messes everywhere and leaving a trail of blood and spit and sweat and tears. You can be quiet. You can say I see you, I see you, I’m here. What else? I don’t know. I’m working on it. Read the rest. Read everything. Also, here’s the always brilliant Liz Bourke on why you should read the Metamorphoses trilogy. Racialicious on how Marjorie M. Liu’s Monstress Explores Our Inner Darkness. Friends, I’m so excited for this series. I continue to resist single issue comics, mostly because of money, so for now I’ll just wait and savour the anticipation. But you can bet I’ll be all over the trade paperback the second it’s out next year. Cory Doctorow on compassion and The Shepherd’s Crown. How Richard Scarry updated his children’s book to be more progressive and inclusive. More soon, and that’s a promise. I definitely want to make an effort to live the life I want, and making sense of things through the words I write here is very much a part of that. Thank you for reminding me that I said that, as I reach the end of another weekend with nothing much to blog about! Blogging ebbs and flows, don't you find? Often November is a slump for me, mostly for work-related reasons (lots of assigned reading and papers to mark) but December -- when classes get out, eventually -- is much better. I also have to remind myself that at least "work" for me includes things like rereading Daniel Deronda, which is certainly time-consuming but hardly unpleasant. Still, here's to getting around to the reading lives we want, sooner rather than later. So many good links to explore, thanks! And thanks for including me! I hope your cold is gone soon and you are feeling energetic for whatever you want to do blogging or otherwise. 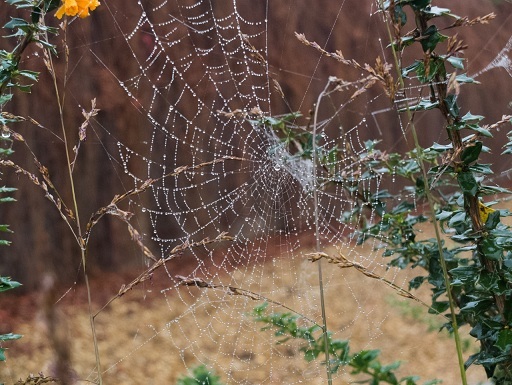 I love your spiderweb photo!